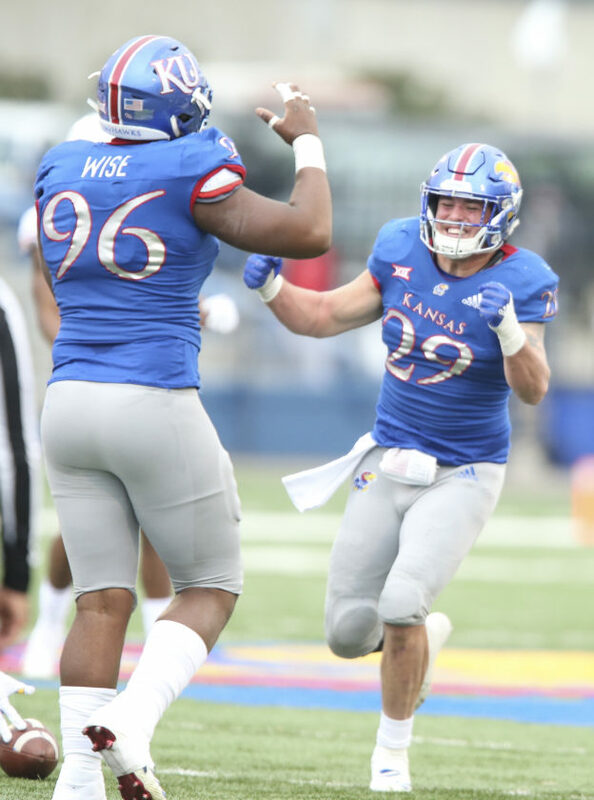 If he hadn’t spent the past five years in the same football program as Joe Dineen, Daniel Wise could have left Kansas as its all-time leader in tackles for loss. Yet, it’s just about impossible to envision Wise, the Jayhawks’ perennial standout on the defensive line the past few years, without his sidekick, Dineen, just behind him at linebacker. 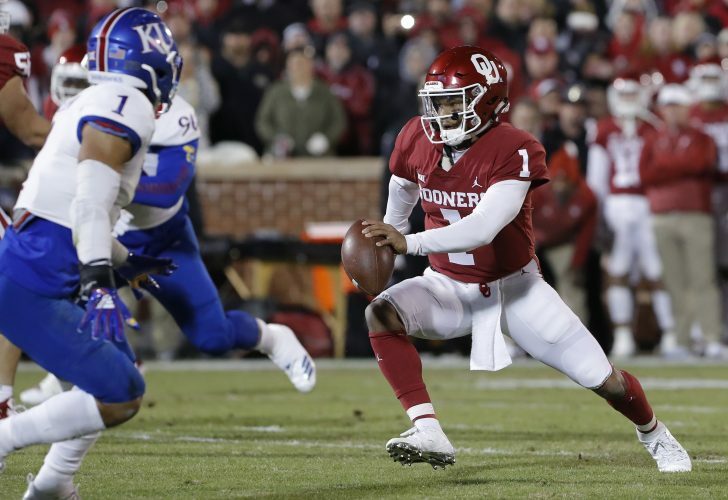 On their way to finishing their time at KU as consensus first-team All-Big 12 performers, the redshirt seniors spent a good part of 2018 racing one another to the top of the school’s career TFLs chart and giving each other a hard time about that and countless other topics along the way. 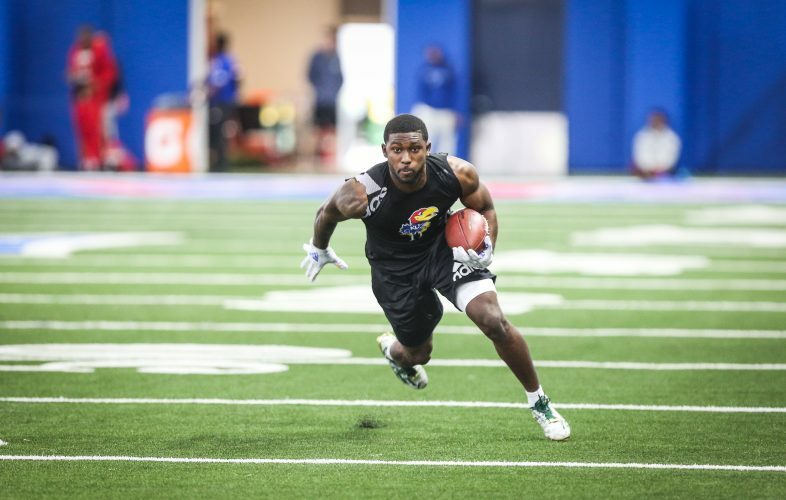 During their last day playing together at David Booth Kansas Memorial Stadium, in the Jayhawks’ season finale against Texas, Dineen not only came painfully close to snagging his second career interception, in dropping a would-be takeaway, he also blew the chance to take off for what looked to be a fairly open 40-yard dash to the end zone in the first quarter. As the linebacker from Lawrence leapt off the turf in disbelief when a potential pick-six turned into a mere pass breakup, there to embrace him and greet him with some hearty slaps on the shoulder pads was his fellow captain, the defensive lineman from Lewisville, Texas. “I was giving him comforting, supportive words,” Wise claimed, sporting a familiarly mischievous grin. Dinnen could only laugh at that cleaned-up version of their exchange. Kansas defensive tackle Daniel Wise smiles as he watches the closing moments of the Jayhawks’ road win at Central Michigan. Wise almost had to get his shots in when he could, because it was on that day that Dineen officially won their season-long TFLs battle. The linebacker finished with 45.5, and atop KU’s record book, while the defensive lineman closed his career with 44 — three more than the old record-holder: Willie Pless (41 from 1982-85). Of course, fortune only played a small factor in either defender’s individual success. 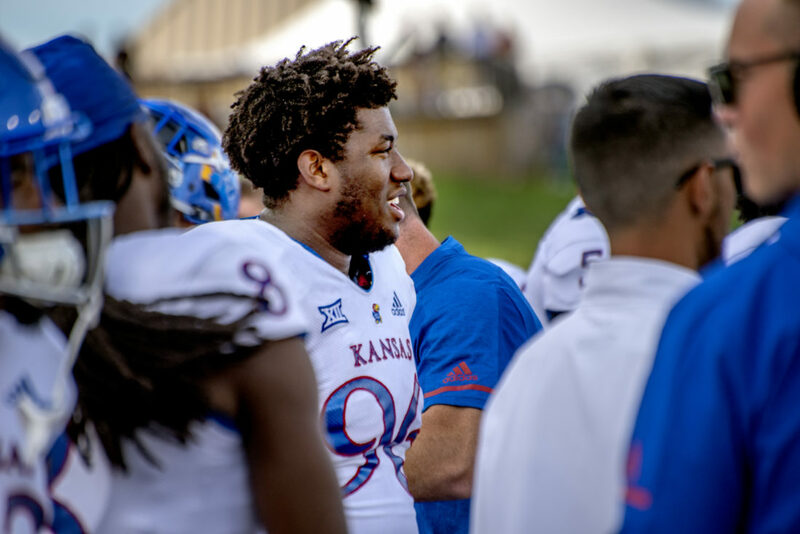 As fondly as Wise said he’ll always look back on the team’s 2016 overtime win over the Longhorns, the 6-foot-3, 290-pound lineman quickly referenced the training he, Dineen and other Jayhawks put in as something he’ll remember most. “Mornings with the guys, in the offseason and things like that,” Wise said. Neither will be able to reminisce about their time at KU exactly the way they hoped. 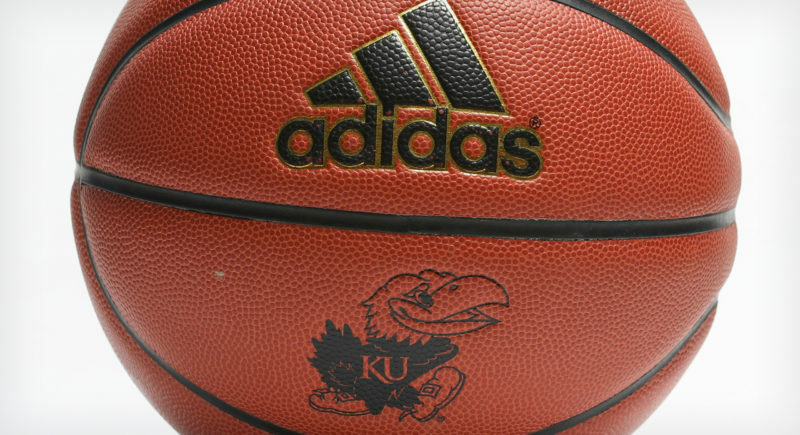 After both joined the program in the 2014 recruiting class, the Jayhawks won a combined nine games during the five seasons Dineen and Wise spent at KU. Still, Dineen said they will be able to leave feeling better about the long struggling program’s state of affairs. After all, KU actually won a road game for a change — breaking a 49-game losing streak outside of Lawrence — on their watch. Wise, too, said he could leave Lawrence without an abundance of grief, because of the progress he thought he witnessed the past several years. Wise also said former KU head coach David Beaty helped “more than people can imagine” on that front. 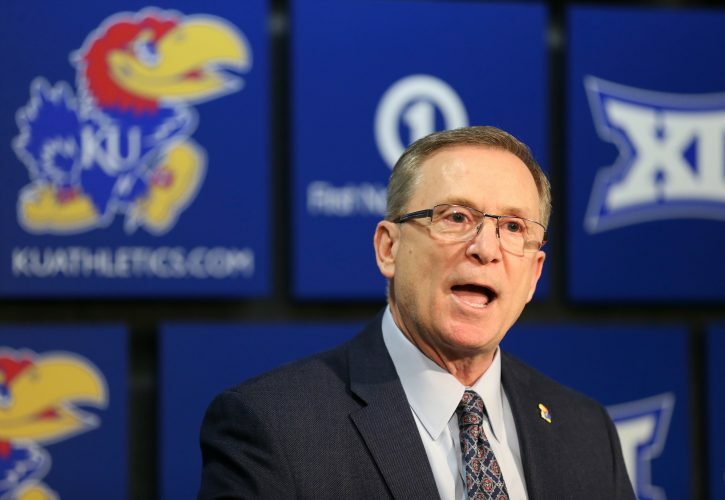 From an individual standpoint, Wise assessed that he put as much as he could into KU football the past five years, and went “hard” the whole way. 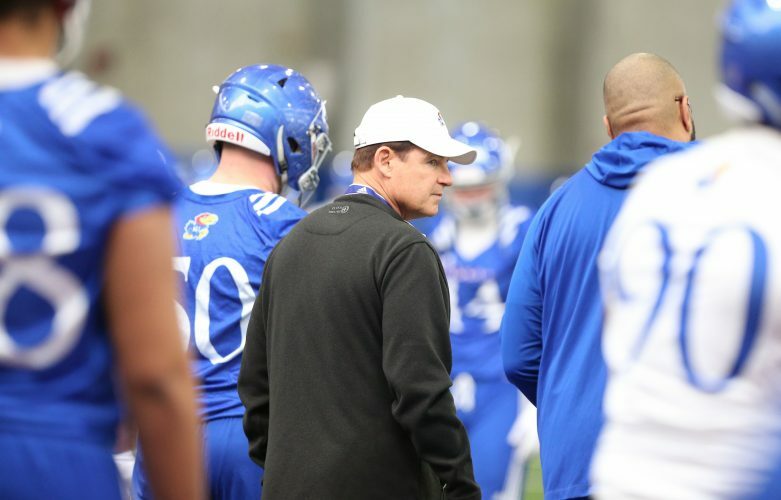 As they leave KU behind, and a new regime led by former LSU head coach Les Miles takes over, Dineen and Wise will remain invested and interested. They just hope to land new jobs that will keep them busy enough that they can’t watch too closely. How often will Dineen be back next season to watch KU, especially since his younger brother, Jay, is still in the program? 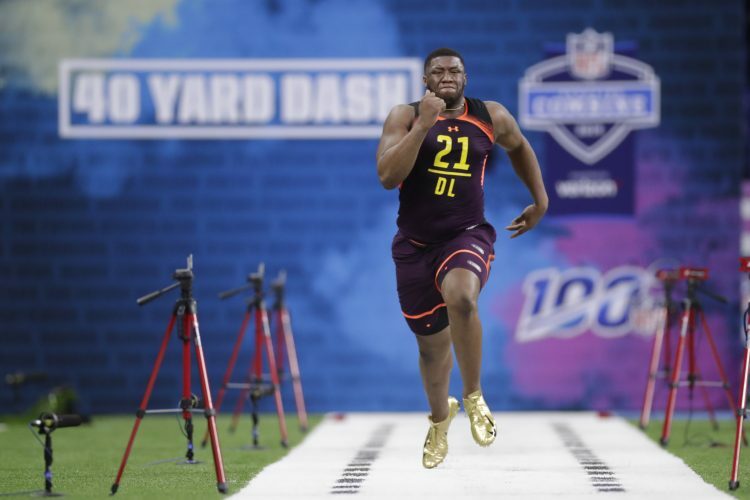 It’s fitting, given how close Dineen and Wise have become, that they’ll enter the grind of predraft workouts and possibly their NFL careers together in the months ahead.